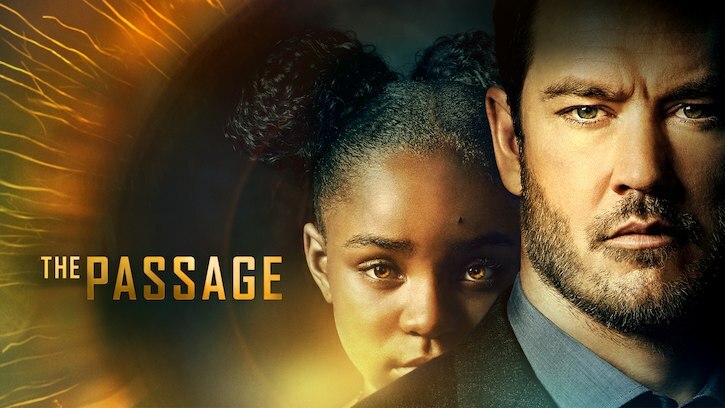 The Passage this week revolved around Carter's story, in another fast-paced, but character driven episode. Carter's past changed considerably from the book, where he was instead a yard worker accused by his employer of abusing her daughter. This would lead to a tussle where the woman would fall into her pool and drown. This is a far cry from the show's version of Carter who we find out was unknowingly in a relationship with a married woman, who kills herself due to his inability to console her. This version does make for better drama on the small screen, as it is more personal than just a random woman he worked with, and I guess you could say it added some sexiness to the proceedings as well. The essence of his story though remained the same, which is what mattered, and the episode did a great job in empathizing us with him. It's great how these character's pasts are being used as a way to push the narrative forward, whether than just a random flashback. Babcock last week showed her past to Richards to win his empathy, and this week, Carter's past was brought up in his dreams by Fanning in an attempt to bring out the vampire within him. The arc of Carter was so well developed that his eventual turn into the vampire felt earned, on top of it being absolutely horrifying. We see in this episode just how powerful Fanning is to be able to intrude into another's memories and manipulate them as he pleases, and it is hard not to feel for Carter as we see him spiralling into darkness. Amy's mind was also intruded upon in 'Whose Blood,' but by Babcock, whose attempts to manipulate the headstrong Amy weren't as successful. It was great to see Amy interacting with someone other than Carter or Brad, which by the way was endearing as always as she exchanged letters with Carter and then her treehouse scene with Brad. But in her interaction with Babcock, Amy's fortitude was on full display - keeping her head high and resolutely demanding for Babcock to leave. The powers of these vamps are quite strong, and having the soldier go mad, as he shot down the facility, really drove the point home of just how close we are to catastrophe. This is only the tip of the iceberg. Elsewhere in the episode was Lila's storyline as the scoop of the missing 12 convicts that Lila provided to the journalist was released. It seems like Lila has put herself in dangerous territory upon finding out that the journalist she was in contact with had got murdered soon after, a storyline, to be honest, that is hard to care about one bit. The Passage could do without Lila's investigation and still not miss a beat. As is, it slows the pace down and takes away from the main action at the lab. Overall, 'Whose Blood is That' continued along the main narrative at a very brisk pace. Flashbacks can often be a detriment to a show, but The Passage has so far used it well as a vehicle to move the narrative forward while developing its characters, without ever getting boring. Now, if only full focus was put on the going on's at the lab without the distraction of Lila's storyline.